Acid rain swept all before it. America held out for as long as Ronald Reagan was in the White House, but capitulated under his successor. Like global warming, acid rain had the vocal support of the scientific establishment, but the consensus science collapsed just as Congress was passing acid rain cap-and-trade legislation. Rather than tell legislators and the nation the truth, the EPA attacked a lead scientist and suppressed the federal report showing that the scientific case for action on curbing power station emissions was baseless. Ostensibly neutral in the Cold War, Sweden had a secret military alliance with Washington. A hero of the international Left, Sweden’s Olof Palme used environmentalism to maintain a precarious balance between East and West. Thus Stockholm was the conduit for the KGB-inspired nuclear winter scare. The bait was taken by Carl Sagan and leading scientists, who tried to undermine Ronald Reagan’s nuclear strategy and acted as propaganda tools to end the Cold War on Moscow’s terms. I’ve got it on Kindle, so will try to find some highlights next week. 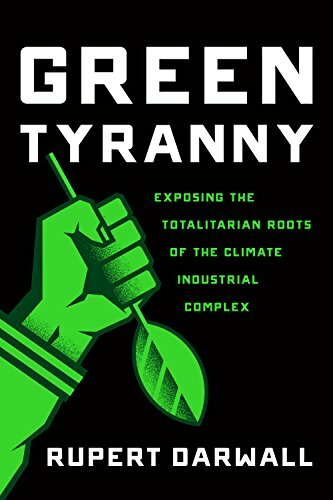 Not just Green tyranny but tyranny of all holier than thou delusional but noble causes having to do with protecting a pristine and perfect planet from the cancer of human activity. Political violence was little-known in Sweden at the time, and Olof Palme often went about without a bodyguard. Close to midnight on 28 February 1986, he was walking home from a cinema with his wife Lisbet Palme in the central Stockholm street Sveavägen when he was shot in the back at close range. A second shot grazed Lisbet’s back. He was pronounced dead on arrival at Sabbatsbergs sjukhus hospital at 00:06 CET. Lisbet survived without serious injuries. Deputy Prime Minister Ingvar Carlsson immediately assumed the duties of Prime Minister, a post he retained until 1991 (and then again in 1994–1996). He also took over the leadership of the Social Democratic Party, which he held until 1996. Two years later, Christer Pettersson (d. 2004), a small-time criminal and drug addict, was convicted of Palme’s murder, but his conviction was overturned. The crime remains unsolved. Obsession with wind power seems to be associated with socialists (and yes, Hitler was a socialist). H.G.Wells makes a significant mention of it in The Sleeper Awakes, published in 1910, and of course Wells was an influential socialist. Renewable energy resembles socialism in that they both promise much but deliver little.